You often won’t find the words “Beaujolais cru” on a bottle of Beaujolais cru. Instead, they’re named after the villages, such as Moulin-à-Vent. 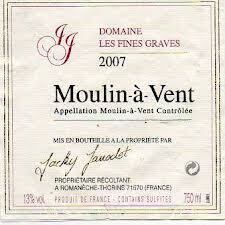 If you haven’t every tried a Beaujolais Cru (and I’m not talking Beaujolais Nouveau! ), what are you waiting for? This wine goes with EVERYTHING! And really good bottles can be had around $20 or so, which is mighty fine weekend drinking. Why they’re great: With their vivacious cherry-berry notes, they have a bit of that acidic Chianti thing going on. The best are shimmery, spicy, earthy, and just fruity enough; that is, though some fruit-forward-loving wine-drinkers might think them best with food, those of you who, like me, enjoy a little refreshment in their red they make fine stand-alone sippers, too. What to look for: Skip Beaujolais Nouveau. You need a bottle that’s “not nouveau,” so look for the name of the village where the grapes are grown: Brouilly, Chénas, Chiroubles, Côte de Brouilly, Fleurie, Juliénas, Moulin–à-Vent, Régnié, or Saint-Amour. To read more: Eric Asimov of the New York Times extolls the virtues of Beaujolais; he also gives some good wine recommendations for the ’09 vintage, which is still out there. It would be one thing if the wine was even somewhat drinkable. But these days, what passes for Beaujolais Nouveau is, by and large, utter crap. That’s just my professional opinion, of course, and no offense meant to those who enjoy a bottle of the banana and bubble gum concoction that is foisted on consumers the third Thursday in November each year. Totally agree! That’s why I like Beaujolais cru (not Nouveau!). If I were a Beaujolais winemaker, I’d do something to effectively distinguish my “cru” wines from “nouveau” Beaujolais, as it’s easy to get confused! Banana-bubble gum is the perfect way to describe a bad bottle of Nouveau!